If you look at a map of India, you’ll see a small sliver of land connecting the subcontinent to a part of India that’s almost totally surrounded by neighboring countries like Bhutan and Myanmar. This encircled portion of India stretches from the Himalayas to the mountainous jungles neighboring Bangladesh. It’s there, amid those lush mountain forests, that you’ll find Meghalaya. Meghalaya, which means “Abode of Clouds” in Sanskrit, has sheltering mountains, living root bridges, crystal-clear rivers, and endless caves. It’s also extremely safe for female travelers. Slowly opening up to tourism, the tiny state of Meghalaya should be on every outdoor lover’s bucket list. Here’s why. 1. Meghalaya has the longest sandstone cave in the world — and 1,650 caves in total. Fewer than 40 miles from Shillong, Meghalaya’s electric capital, lies the wettest place on Earth: Mawsynram. Close to there is Krem Puri, the world’s longest sandstone cave. Stretching a startling 15 miles, the cavern is a dream come true for a caving enthusiast. Krem Puri also contains what is believed to be dinosaur fossils from 70 million years ago. Do not go caving during the rain-soaked monsoon months of May to September. In winters, when the climate is drier, Meghalaya Adventurers’ Association (MAA) organizes annual caving expeditions in the state. Underneath its lush hills, Meghalaya is home to mysterious turns and twists, hiding captivating stories of a bygone era. While some 490 kilometers of caves have been already mapped, there’s more begging to be explored, mainly in the East Khasi Hills. 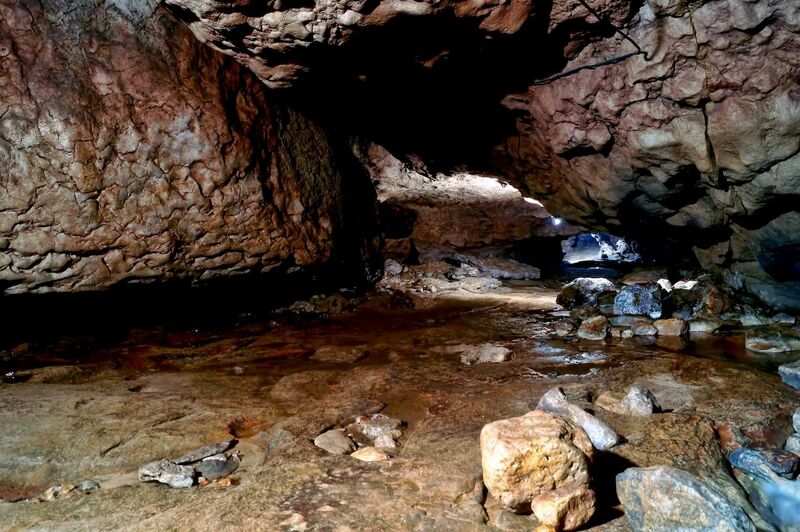 About 1,000 caves and cave systems in Meghalaya are either fully or partly explored. While adrenaline junkies may prefer longer caving expeditions, Arwah Caves is a fascinating experience for beginners. Tucked inside the jungle in Cherrapunji, locally known as Sohra, Arwah Caves is a limestone cave with fossils, stalagmites, and stalactites. As it’s not on many people’s radar, its charm lies in its eerie silence. This contrasts with the noisier, much-visited Mawsmai Caves a few kilometers away. 2. You can kayak in crystal-clear waters. Water-sport enthusiasts frequent Shnongpdeng, a little village located close to the Bangladeshi border. Here, you can either stay in a cute bamboo hut by the Umngot River or in a tent. During monsoons, the water is muddy brown and not ideal for kayaking. When October nears, the rains disappear, and the river turns an inviting blue-green shade. Apart from kayaking, tour companies also organize boating, canoeing, and cliff jumping. Tucked away in the lesser-known West Khasi Hills, Mawphanlur has 10 lakes and very few houses. You can either paddle in a rented kayak or canoe, or hike its many peaks in hopes of discovering a new lake to yourself. Traveller’s Nest is the only accommodation option here. With its impressive bodies of water and rocky structures, Mawlyngbna is another place for kayakers. You can easily reach Mawlyngbna from Mawsynram. It’s not only one of the best water-sport destinations in the region, but the tiny village is also home to fossils and a split rock, where you get a stunning view of the nearby Bangladeshi plains. 3. The state is home to Asia’s second largest river island. While East Khasi Hills has become better known within India, West Khasi Hills is still an off-the-beaten-path destination. The biggest town of West Khasi Hills is Nongstoin. From there, a bumpy taxi ride takes you to Nongkhnum Island, Asia’s second largest river island. With paddy fields nestled between cloud-hugging mountains, the journey to Nongkhnum is a fascinating one. 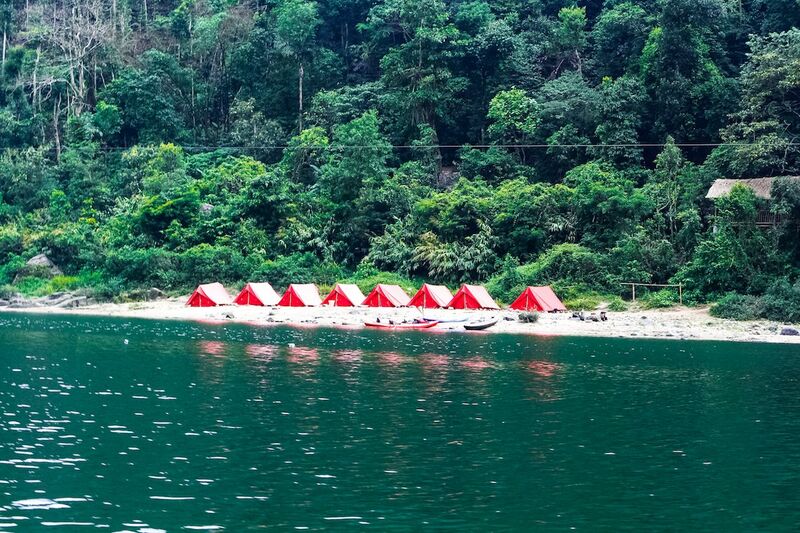 You can travel to Nongkhnum with Chalo Hoppo, which organizes night camping on the island. While you are in Nongkhnum, don’t forget to visit Weinia Falls. 4. There are living root bridges. Some hundreds of years ago, locals in Meghalaya weaved together the above-ground roots of Indian rubber trees to form bridges across rivers swollen by monsoon rains. (The bamboo they’d previously used to construct bridges would often break.) It takes up to 20 years for the tangled root web to connect the two river banks, but then the root bridge only grows stronger with time. These impressive structures are scattered across Meghalaya, but only a few are accessible today. In Nongriat, a two-level root bridge connects the banks of river Umshiang, giving it its famous name, “Umshiang Double-Decker Living Root Bridge.” It’s only accessible by foot after first climbing 3,500 steps to reach Nongriat from nearby Tyrna. 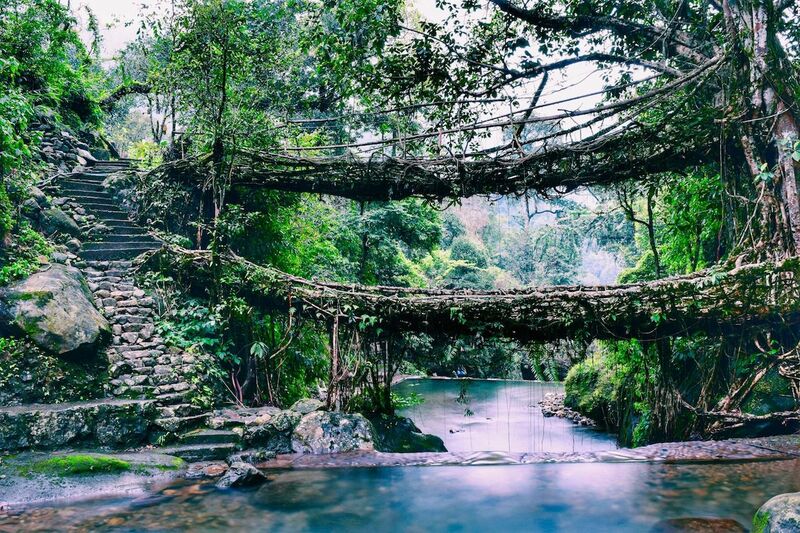 In the south, a tiny, well-organized village called Mawlynnong has earned the title of “Asia’s Cleanest Village.” Near Mawlynnong in Riwai, a single-decker root bridge attracts travelers from all over the world. Unlike the bridge in Nongriat, the root bridge in Riwai is easily accessible and only takes 15 minutes to reach from the main road. 5. Sohra is home to India’s tallest plunge waterfall. 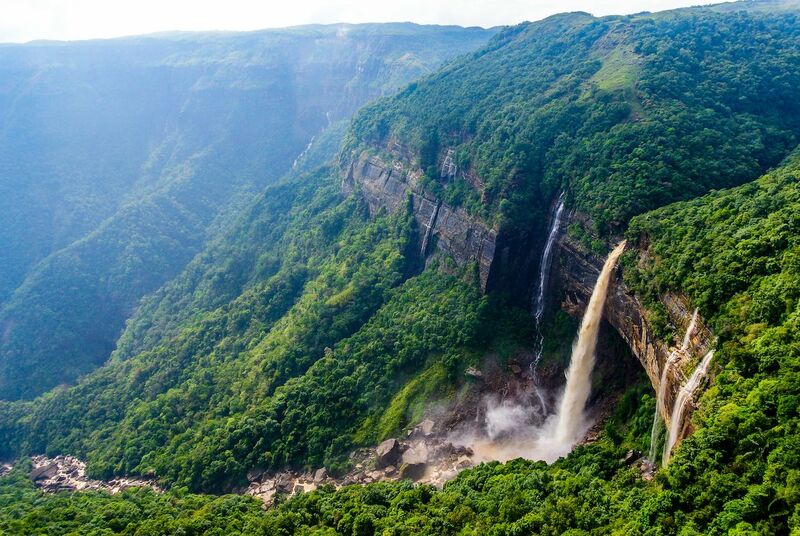 The most visited area of Meghalaya is the subdivision of Cherrapunji as the region is widely known. Just try not to call it that. The official name is now Sohra, and given that the old name was handed down during British rule, Sohra is the name locals prefer. Sohra is home to India’s tallest plunge waterfall, Nohkalikai Falls, which rushes down the jungle-clad hills, forming a blue base pool. A few kilometers away, locals and visitors from neighboring Assam state frequent the Dainthlen Falls on weekends, where music and BBQ sessions are aplenty. Seven Sisters Falls, locally known as Nohsngithiang Falls, gets its name from the seven streams that tumble down the East Khasi Hills to nearby Bangladeshi plains. Apart from these better-known falls, Sohra is home to hundreds of hidden falls such as Wei Sawdong Falls, masked by the dense forests near Dainthlen. Waterfalls come to life during monsoons and new, tiny cascades are given birth by the heavy rains across the state. 6. 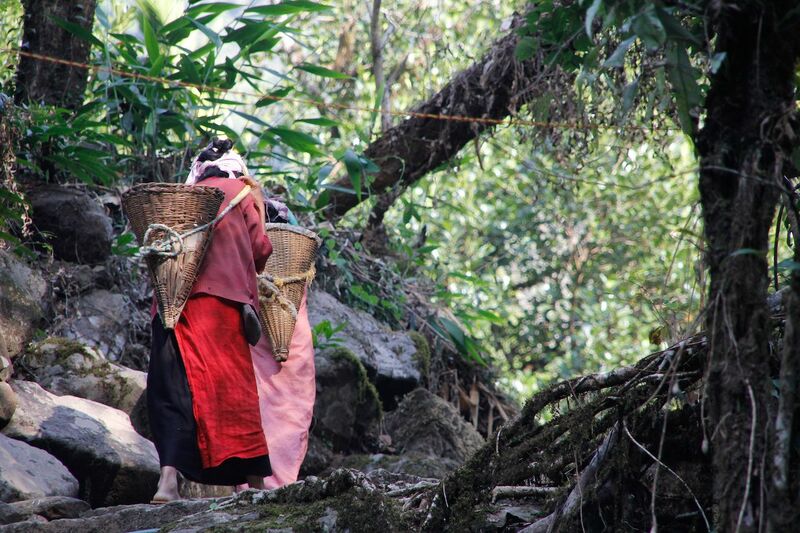 It’s home to one of the world’s last matrilineal tribes. The Indian state of Meghalaya has three major hill areas: Khasi Hills, Jaintia Hills, and Garo Hills. Although Khasis, who make up the main tribe in Meghalaya, are scattered across the state, Khasi Hills is their historic home. The Khasi tribe follows a matrilineal and matrilocal system. In fact, theirs is one of the world’s last few matrilineal societies. While the community is still patriarchal, as in many parts of the world, the women receive the utmost respect — making it one of the safest solo female travel destinations in India. That said, Meghalaya is still very remote, and if you’re a first-timer, it’ll be a bit harder to navigate across its rain-fed subtropics. 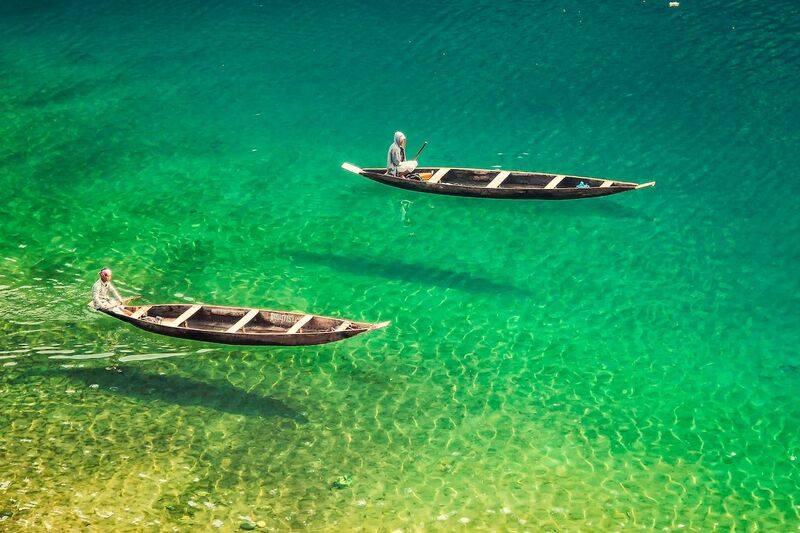 Organized tours to Meghalaya can be booked via many Northeast Indian travel companies, such as Greener Pastures, which combine a bit of culture with your usual outdoor adventures. 7. Shillong is the Rock Capital of India. Surrounded by moss-clad hills, serene lakes, and hidden waterfalls, Shillong is called the “Scotland of the East” by the British. Today, the city center is just like any other chaotic Asian city. 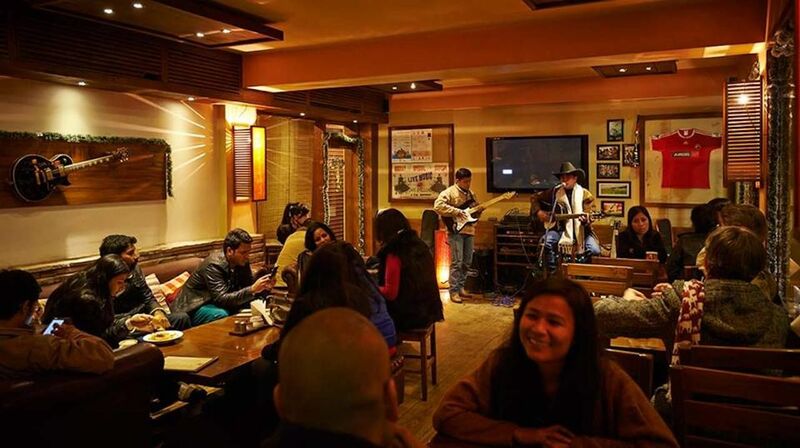 However, the hill capital is home to a happening fashion scene and an electric music culture, giving Shillong the name the “Rock Capital of India.” Live jam sessions happen almost every day in Shillong. Laitumkhrah is Shillong’s hip neighborhood, where the café culture is one of the coolest in India; get your caffeine fix in the area at Café Shillong. With its cheerful vibe and warm, welcoming locals, Shillong is the perfect place to end your adventures in Meghalaya.